In the winter of 1995, Bruce Springsteen reassembled the E Street Band with just three days notice to record a few songs to add to the release of his Greatest Hits album. 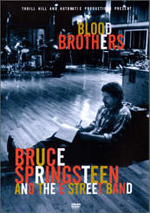 Originally airing on the Disney Channel in March '96, Blood Brothers is a chronicle of this reunion that both sheds light on the dynamics that Springsteen and the E Street band shared and illuminates the creative process in the recording and mixing of music in the 1990's. DVD: Standard 1.33:1; audio English DD 5.1 & PCM Stereo; subtitles none; single sided - single layered; Not Rated; 90 min. ; $24.98; street date 1/16/01. In early 1995, Bruce Springsteen reconvened the E Street Band for the first time in more than six years. After 1988’s “Tunnel of Love Express Tour” and a subsequent jaunt as part of the Amnesty International “Human Rights Now!” excursion, Bruce clearly had come to a point where he needed a change. He’d split with wife Julianne Phillips in 1988 and then coupled with Patti Scialfa, back-up singer/guitarist in the ESB. Bruce made some small attempts during the TOL tour to shake things up via repositioning of band members, but I guess that wasn’t enough; in 1989, he formally indicated the he wouldn’t continue to work with the group. This news hit many fans like a ton of bricks, but personally, I was happy to see Bruce attempt something different. Too many acts rely solely on the “tried and true”, so it was exciting to witness these attempts to spice up the old routine. I thought the shows performed with an almost-totally new band - pianist Roy Bittan carried over to the fledgling group - during the 1992-93 were surprisingly fresh, and Bruce seemed energized. And it wasn’t like he’d gone and killed everyone in the ESB. Clearly there was no reason why Bruce and the E Streeters couldn’t work together again if the time was right, and apparently Bruce felt that occasion had come when 1995 arrived. He planned to release a “Greatest Hits” compendium and decided to record some new songs for that album. As such, the E Streeters were summoned, and they dutifully came. Blood Brothers provides a basic documentation of that experience. At its heart, it follows the progress made on the title track. We first hear “BB” in demo form as Bruce plays it solo accompanied by acoustic guitar, and we later see it move through various band renditions until they finally achieve a version to the satisfaction of all (though mainly Bruce - in his world, others definitely have a voice, but his word is absolutely final). In addition to this, we see other elements of Bruce’s reunion with the ESB and the recording process. Unfortunately, examples of insight are few. We observe some interesting looks at how Springsteen works with others and how he communicates what he wants from the music, and those bits are quite compelling. Unfortunately, Blood Brothers offers too few moments like that one, and the result is a mediocre program. Yes, it’s great to get some glimpses of the creative process, but the whole thing lacks much depth. The show seems fragmented and although the evolution of the title tune adds a mild framework, it doesn’t move the piece along terribly well. Ultimately, Blood Brothers is a “must-see” for Springsteen fanatics but it’ll be of limited interest to anyone else. Blood Brothers appears in an aspect ratio of approximately 1.33:1 on this single-sided, single-layered DVD; due to those dimensions, the image has not been enhanced for 16X9 televisions. As a whole, I found the program to appear watchable but not anything better than that, for BB provided a fairly drab presentation. Sharpness generally seemed a bit muddy. The quality varied throughout the film, as some shots - especially those from the making of the “Murder Incorporated” video - appeared rather crisp and detailed. However, the rest of the show didn’t live up to those standards, and it looked fairly hazy and mildly soft. Moiré effects weren’t a concern, but jagged edges popped up due to the various musical instruments. Print flaws proved to be somewhat distracting. The program showed light but persistent grit and speckles, and I also detected light grain. Most annoying, however, were some small hairs that occasionally cropped up at the bottom of the screen. A bit of debris could be seen there from time to time, but it was mainly these little lines that got on my nerves. Colors looked heavy and unnatural. Throughout the program, the hues came across as thick and bland, with little clarity or verve. Black levels appeared acceptably dark, and shadow detail usually was decent, though low-light shots could seem a bit impenetrable at times. It should be remembered that Blood Brothers was an inexpensively-made little documentary, and most of the problems observed result from that source. However, it remains a fairly unattractive image nonetheless. The quality of the program’s Dolby Digital 5.1 soundtrack demonstrated an improvement over the picture, but it was a disappointment as well. When I watch a music program, I expect good reproduction of the songs, and that occurred to a degree. The various tunes appeared pretty clear and dynamic for the most part. Instrument delineation was positive, and dynamic range seemed generally solid. This varied depending on the source - the snippet of “Cadillac Ranch” heard during the Tramps soundcheck seemed pretty raw - but music largely appeared clean and rich. However, the other elements seemed more problematic. The soundfield interfered at times. It was a modest spread to the sides and the rear, and it worked fine for the musical performances. Those essentially sounded like straight stereo, as the surrounds added little more than general reinforcement of the tunes. However, a vague echo has been provided for the non-musical sequences, and this became quite annoying at times; I suppose someone thought this made the situation seem more involving, but I found it to be a distraction. That was especially true because the clarity of many non-musical segments seemed somewhat weak. For all intents and purposes, the audio of BB consisted just of music and speech; effects were not an important factor, as they all fell in the category of ambient audio. As I noted, the music sounded pretty good, but the dialogue was more of a concern. Due to the documentary techniques, it can occasionally be tough to hear what Bruce or the others said, and the echo from the rear didn’t help matters. (Thankfully, the DVD included subtitles, which really helped in these instances.) Ultimately, most of the audio seemed decent, and the musical sequences came across well, so the soundtrack earned a “B-“. Blood Brothers contains very few supplements. We find the music videos for both “Murder Incorporated” and “Secret Garden”, and that’s it. Since both of those clips also appeared on Bruce’s simultaneously-issued Video Anthology 1978-2000, that makes their inclusion here less valuable. Frankly, I doubt many people will buy BB but not the VA, though I think the reverse situation will be true, as I expect the video collection will sell much better. In any case, it’s nice that the videos appear here, but we don’t find any other added material. One reason why that’s especially disappointing relates to a prior video release of Blood Brothers. Back in 1996, there was a VHS version that added a special five-track compact disc. That platter included two songs that can be found on separately-issued singles - the live version of “Blood Brothers” heard in the video and the mix of “Secret Garden” that features strings - but it also tossed in three songs not available elsewhere. We got the alternate version of “Blood Brothers” plus “High Hopes” and “Without You”. All three of those tunes can be heard briefly during Blood Brothers, but the supplemental CD remains the only place they can be found in their full versions. The BB DVD easily could have provided them. After all, the VA generously tossed in the audio-only track for “Lift Me Up”, another obscurity. Ultimately, Blood Brothers is a program that’s best left for the most dedicated Springsteen fans. For those of us who count ourselves in that camp, it provides a moderately interesting look behind the scenes at Bruce’s creative process. However, I didn’t get a lot of insight; it’s more of a postcard than a book. The DVD offers fairly mediocre picture and sound plus only a couple of extras. If you’re a diehard Bruce fan, you’ll want to have Blood Brothers, but for others it’s a rental at best.